The North Meet – Aftermath. Well the next North Meet has been and gone now and needless to say it was another brilliant day with fun had by all! It started off with AshSi breaking down at the busiest set of traffic lights in Sheffield on the way out but we soon sorted it out and made our way out to the Millstone Inn situated in the lovely Peak District National Park. 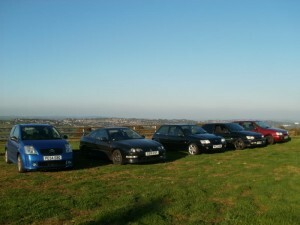 We had another good turnout of cars with a total of 7 cars and 9 people overall. Once we had all had a good chat and Percy had put his very cool dj hero cap on to ward away the suns harmful rays, we went in the pub for another epic meal! The food was once again top notch and once everyone was full to brimming (with coke in the case of brit-fez!) we went out for a convoy around the brilliant roads in the area. Percy and Ry managed to lose their way initially but once we had all regrouped, fun was had by all convoying to the next pub, from which we carried out a number of passenger rides in each others cars. The day drew to a close as people had to head back home, leaving myself, AshSi and brit-fez braving the cold to the bitter end. Eventually it got the better of us and we all went our separate ways once more. Overall the day was a great success and all I can say now is, here’s to the next one! The FSi Rolling Road Day 2011!